This is Katie, dropping in for a quick announcement! While I was doing the New Tune a Day project, I got requests all the time for the sheet music. Although some sheet music is available online in different places, lots of folks wanted to see sheet music with the variations, notations, and ornamentations I used in my videos. So I've compiled a bunch of the public domain tunes together in this volume. This first volume includes Irish jigs and reels. Future volumes will include Irish slip jigs, hornpipes, slides, and polkas; Old-Time tunes; and the other miscellaneous tunes I learned over the course of the project. When you click on the Paypal button, you will be directed to paypal.com where you can pay via credit card or paypal balance. Then, you will receive an email with a PDF attachment of the tunebook from me with in 1-2 days of your order. The whole tunebook is $12.99! I will be recording an album to go with each volume. Each album will include slowed-down and regular-tempo versions of these tunes. Volume 1's recording will be available this summer, so stay tuned here, or on facebook or Youtube! 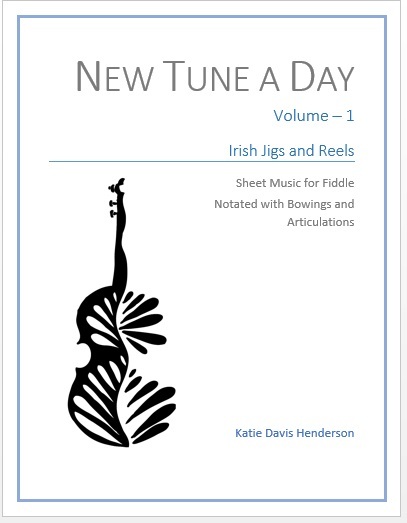 New Tune A Day Volume 1 (Irish Jigs and Reels) is now available for $12.99. When you order, you will receive an email with a PDF attachment. All content is (c) Katie Davis Henderson 2011. All videos are licensed under Creative Commons, so reuse is encouraged. The band logo at the top is (c) Katie Davis Henderson.